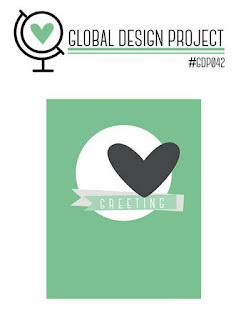 Welcome to another Global Design Project amazing week! I am excited about it being a sketch challenge this week because I know everyone is going to come up with some amazing things. Today I struggled getting a card to happen. I think that I am suffering with - "too much new stuff to play with and i'm overwhelmed" syndrome. I just want to play with all the new stuff all in one card! I just about did with this one today. I went very literally with my card and sketch today. I think it is all my little brain could handle. I used my favourite colour combo - even though I started with completely different colours.. lol! 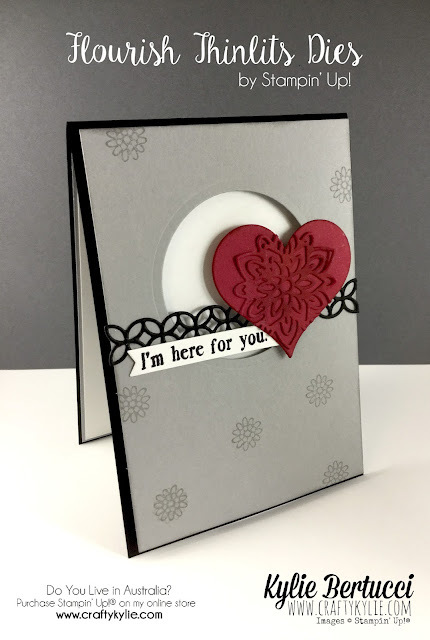 I used the new layering Circles, and popped up my smoky slate cardstock on dimensionals. I stamped the smoky slate with smoky slate with the small flowers found in the Falling Flowers stamp set. They are just so sweet and just what I needed to fill in the blank space. The heart was cut using the Sweet & Sassy thinlits and I decorated it with one of the flowers from the Flourish Thinlits dies as well as added the trim from that set. I love that trim! The sentiment is from the Fresh Fruit and I cut that out using the cool new label thinlit found in the popcorn box thinlits! Didn't I warn you that I used just about all I could! lol. Thanks so much for coming by today - make sure you head over to the Global Design Project to see what the other designers have come up with as well as all the wonderful projects that are added. Hope you get to play along too!